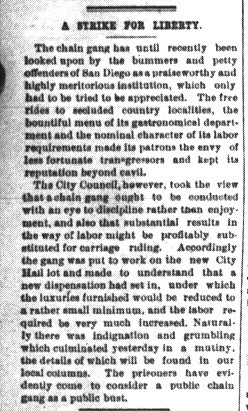 Thanks to the great people from the California Digital Newspaper Project, San Diego’s first newspaper, the Herald (1851-1860) is now available online. Digitization of this historic newspaper was supported by a grant from the State-funded California Revealed Project. 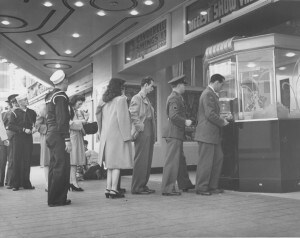 The CDNP digitized the Herald from microfilm held by Special Collections at the San Diego Public Library. 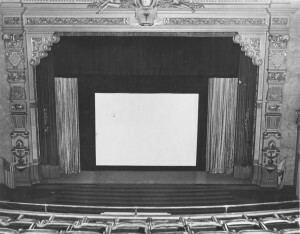 The film itself derives from the only surviving hard copy run of the Herald–donated to the library by E. W. Morse in 1901. Now the whole collection is available on the Internet with full-text retrieval. Give it a go from the CDNP website. Below is a quick sample, featuring one of San Diego’s most notable characters! Here’s a quick stocking idea that’s just a click away on AMAZON. 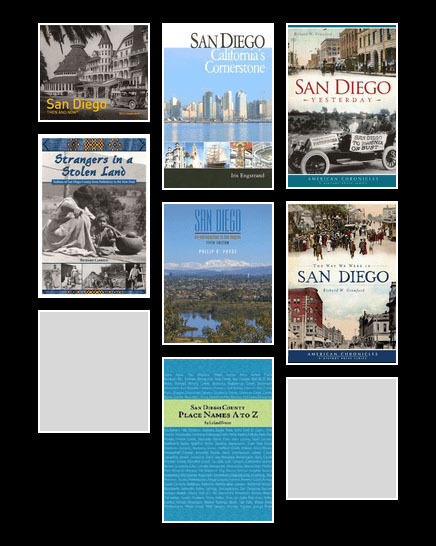 Each book has 38 stories originally published in the San Diego Union-Tribune. Topics include San Diego people, military, schools, water, sports, crime, scandal, and more–all illustrated with historic photographs. Back in July 2017, I did a talk on San Diego founder Alonzo Horton for the Gaslamp Quarter Historical Foundation. Attached here is the video recording of that lecture. Audio is sometimes iffy but overall, a nice production done by Bill Keller, a docent at the Gaslamp Foundation. In the matter of requiring prisoners in the county jail to perform labor, a resolution … to compel prisoners to work on the roads and streets was adopted. In the matter of the getting balls and chains for chain gang …the Sheriff was authorized to secure six balls with the necessary chains, for a chain gang. 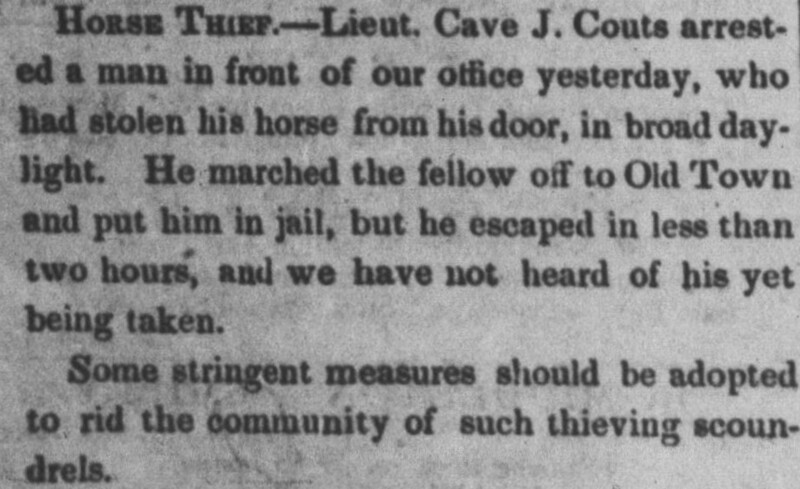 – San Diego Union, January 18, 1883. 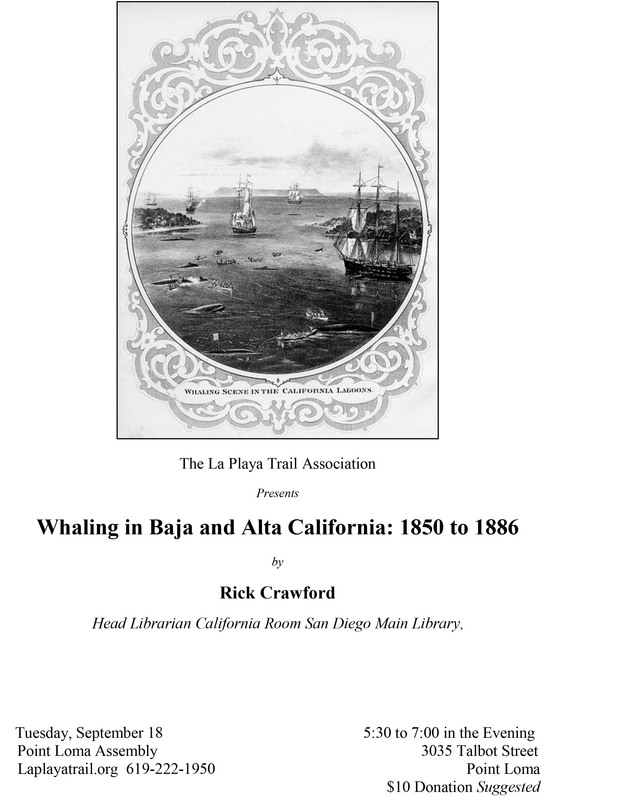 Here’s a new listing of favorite San Diego titles that circulate from the Public Library. It’s a highly subjective list but these are all good books, many written by good friends. There’s a few websites here too, including this one. 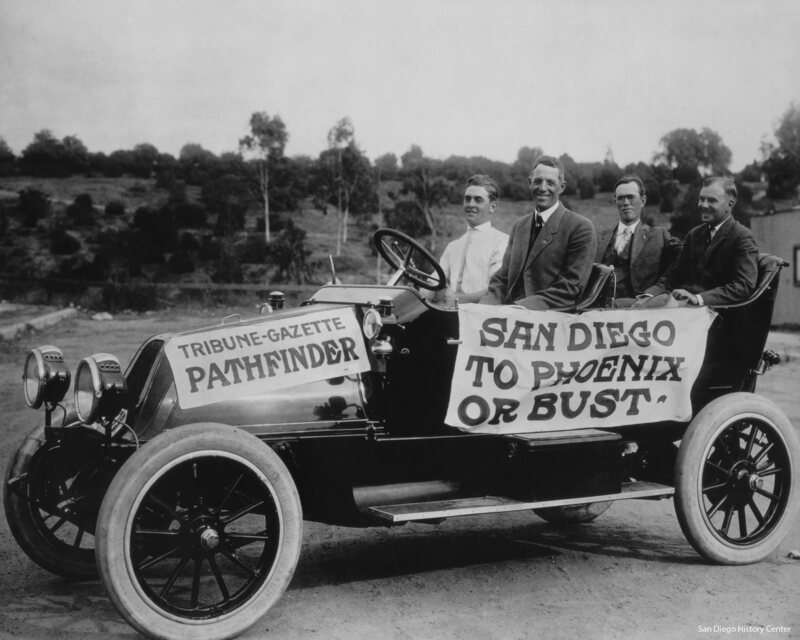 San Diegans marveled at the sight of Charlie Collier’s automobile in 1900. His three-wheeled “French design” vehicle could speed up to 25 miles per hour and go 50 miles on three quarts of gasoline. For most San Diegans, it was the first automobile they had ever seen. Read the story of how San Diego Discovers the Automobile. Tags: Albert A. Thomas, Albert G. Spalding, automobiles, cars, D.C. Collier, E.S. Babcock, Edward M. Fly, George Hensley, John U. Wildrin, Locomobile, National City, Roy Howard, San Diego Cycle & Arms Co. 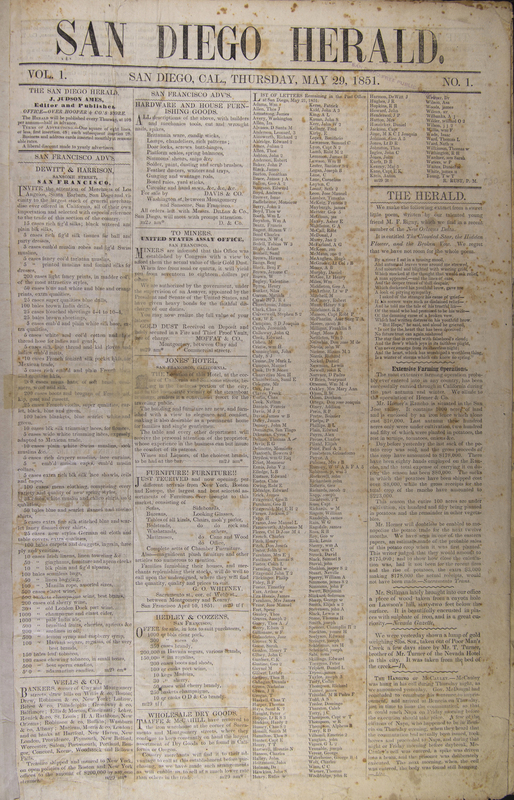 The first issue of the Herald. After surmounting difficulties and suffering anxieties that would have disheartened any but a “live Yankee,” we are enabled to present the first number of the Herald to the public. –John Judson Ames, editor, San Diego Herald. San Diego’s first newspaper, the Herald, appeared on May 29, 1851, only twelve days after the first issue of the Los Angeles Star—the earliest newspaper in Southern California. The editor and publisher of the Herald was thirty-year-old John Judson Ames, a towering, six-foot six-inch “live Yankee” from Calais, Maine. Read the story of John Judson Ames and the San Diego Herald. “GO!” Major General Leonard Wood, chief of staff of the United States army, gave the command . . . The first automobile in the desperate San Diego-Phoenix race shot forward with a bound. –San Diego Union, Oct. 27, 1912. In the fall of 1912, San Diego challenged Los Angeles to a road race across the desert to Arizona. The story of The Great Race. Ed Fletcher behind the wheel of his 20 hp Franklin “race car.” Special Collections, University of California, San Diego. Book talk coming . 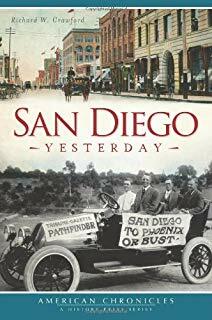 . .
Friday, July 22, 2:00-3:00 pm: Richard Crawford will speak on “San Diego Yesterday.” Rick is the Manager of Special Collections at the San Diego Public Library. He is the former Archives Director at the San Diego Historical Society, where he also edited the Journal of San Diego History for nine years. He has degrees in history (San Diego State University) and library science (San Jose State University). 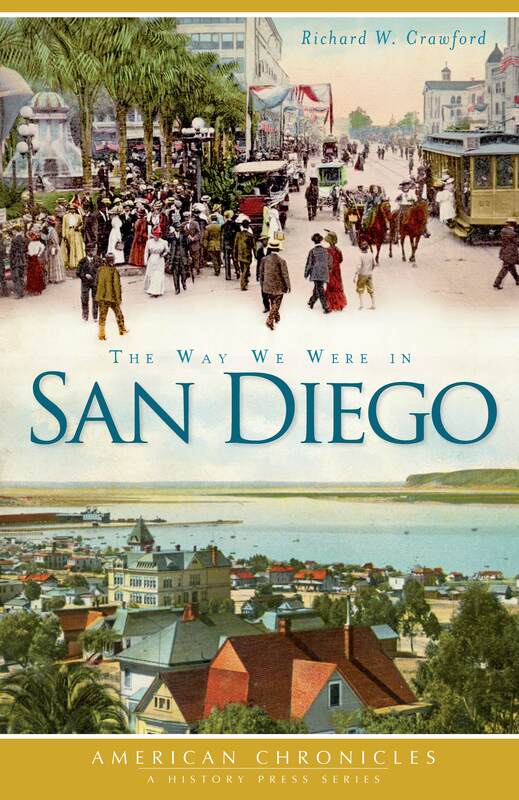 As a historian and archivist, he has written extensively on local history, including the books Stranger Than Fiction: Vignettes of San Diego History, The Way We Were in San Diego, and most recently San Diego Yesterday.